In the invention industry, things change; they evolve. This sentiment holds especially true for the Mega Bacon Pan, which evolved from our client Jean’s Meatball Baker. QVC host David Venable was intrigued and excited about the Davison-designed product! During the segment, Chef Tony showcased the possibilities with this innovative kitchen product, which included perfectly-cooked bacon, jerkies and even healthy chicken breasts! The two-part pan with baking sheet and wire rack holds 18 slices of bacon and elevates each slice out of its own grease on a diagonal, so that the fats and oils can drain away for a crisp, flavorful piece of bacon! “We say goodbye grease, hello flavor!” said Chef Tony, as he was showcasing the product to viewers across the country. 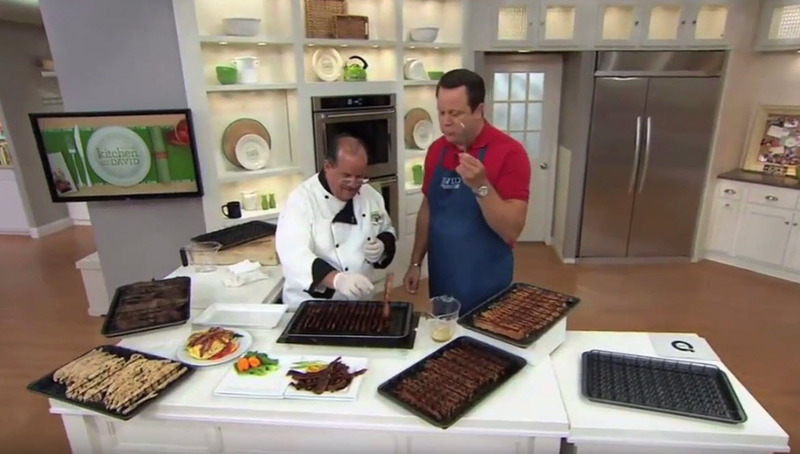 During the segment, both Chef Tony and David Venable showcased the perfectly-cooked bacon, which the pan allows to cook on its side. While this sizzling news was exciting, this month, we want to use this QVC appearance as a lesson in confidence for those idea people who are working towards their invention dreams. Chasing after your dreams requires discipline, knowledge and the courage to take the necessary steps in order to get you closer to your goals. Whether you have an idea for a kitchen product or an idea for another category, think of how Jean’s belief in her idea brought her product to success and even evolved into other successful products! We encourage you to use Jean as a source of inspiration and motivation along your journey as she is a great example of what can happen when you believe in your idea and work hard to hopefully see your product in the spotlight, too. Are you ready to move forward with your idea? Submit today! A Better Way to Bake Lasagna on QVC Today!